When I was leafing through one of my favorite cookbooks recently, Miss Mary Bobo’s Boarding House Cookbook: A Celebration of Traditional Southern Dishes that Made Miss Mary Bobo’s an American Legend , a recipe for Pot Roast caught my eye. It had a can of cranberry sauce in it. I had never heard of using cranberry sauce for pot roast, but after researching pot roasts with cranberry sauce on the internet, I see it’s a fairly common thing. And I do love Cranberry Meatballs, so I thought why not Cranberry Pot Roast? Well, it turns out the pot roast doesn’t really taste like cranberries at all. But the sauce really develops a wonderful, almost indescribable flavor with just a slight sweetness and it has a fabulous deep reddish-brown color. There’s really nothing like a pot roast cooked in the crock pot. A cheap piece of meat turns into the most succulent, tender, juicy, and flavorful meal. 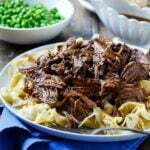 I like to serve this pot roast over either egg noodles or mashed potatoes with a side of peas. Actually, I like to mix the peas in with the pot roast, but my family objects to that. Pea haters. I don’t understand them. 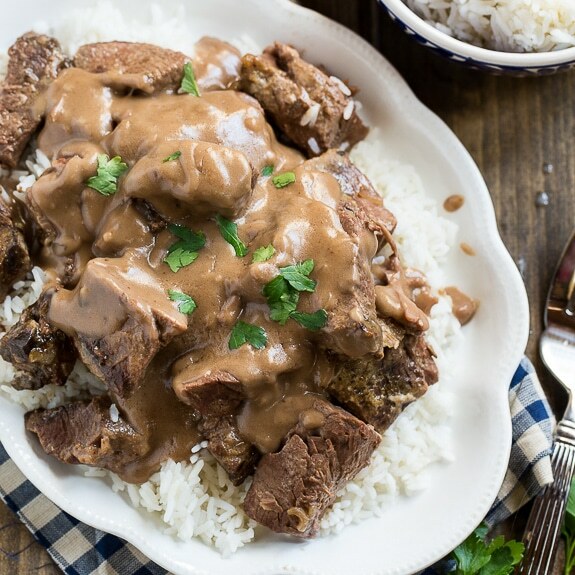 If you have an Instant Pot, try this delicious Pot Roast Recipe! 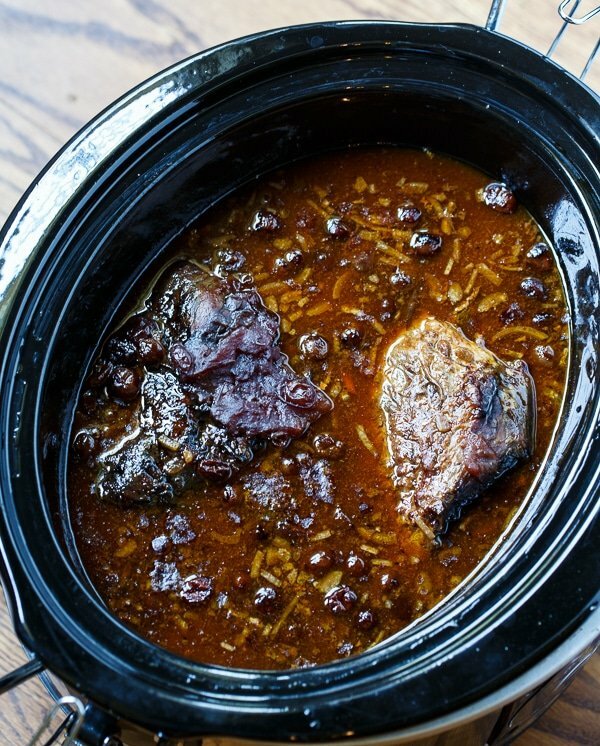 A tender and juicy Crock Pot Pot Roast made with dry onion soup mix and a can of cranberry sauce. Super flavorful and easy to make! Heat bacon drippings or oil in a large pan. Add pot roast and sear on all sides. Place in crock pot. Combine cranberry sauce, tomato sauce, water, and onion soup mix. Pour over pot roast. Place lid on crock pot and cook on LOW for 8 to 10 hours. Place hot cooked noodles on a serving platter. 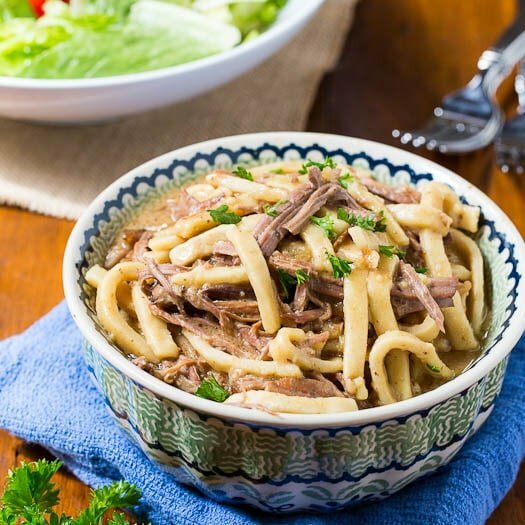 Remove meat from crock pot and place on top of noodles. Dissolve cornstarch in about 1 tablespoon water. Add to liquid in crock pot. Place lid back on and turn to HIGH for 10-15 minutes. Pour gravy over meat and serve. This entry was posted in Dinner, Main Dishes, Slow Cooker and tagged beef, Cranberry, crock pot. Bookmark the permalink. 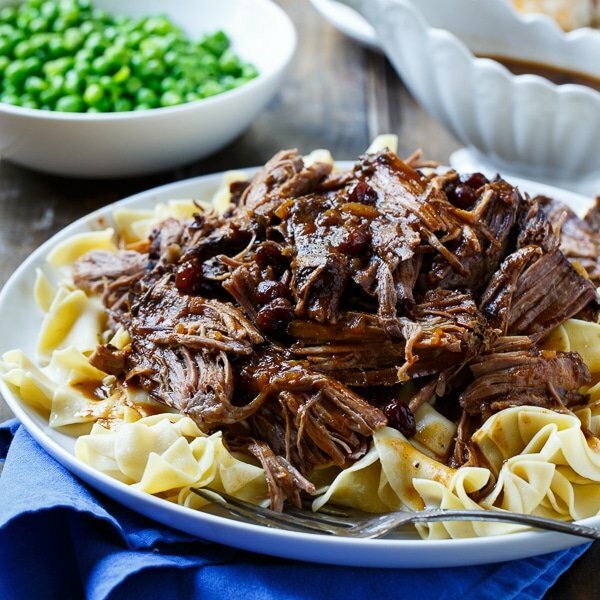 This pot roast looks so tender and amazing! Slow cooker meals are my favorite and I love the wonderful color and bump of flavor from the cranberry sauce! This sounds amazing…now I know what to do with leftover cans of whole cranberry sauce after Thanksgiving and Christmas. I am a total crock pot fanatic, especially in the fall! All the wonderful comfort food that can come out of that thing! I love adding sweet to savory — this is definitely going on my to try list! Looks yummy! And sauce sounds wonderful! Christin! 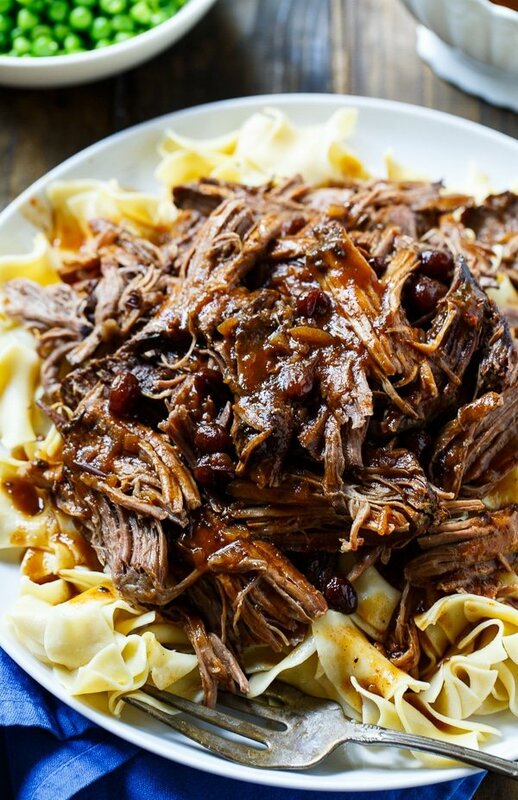 love that you made this pot roast in a slow cooker!!!! and love that you served it over egg noodles! looks so delicious! 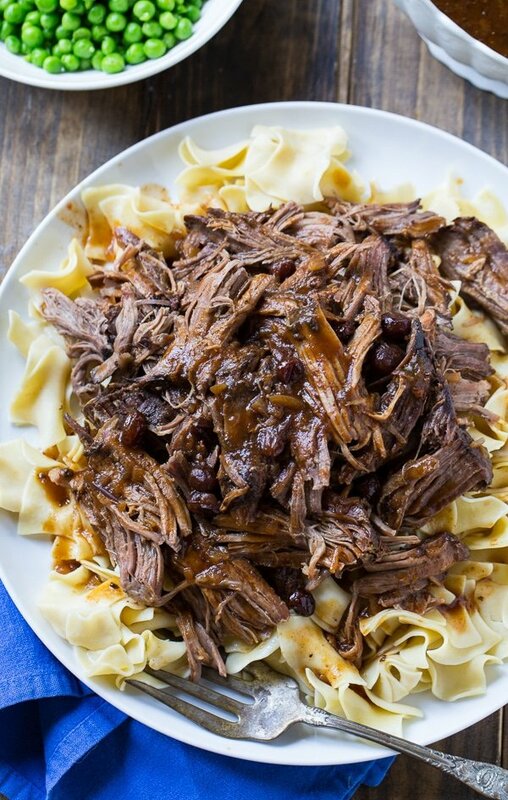 I totally agree, there’s nothing quite like a pot roast make in the crock pot. And it’s so nice to just throw it in there and let it work its magic. This roast looks amazing, Christin! Sounds like it’s so flavorful!